A few people have asked us how Pete makes his Greek yoghurt, so I thought I’d upload the tutorial we wrote for friends a few years ago. 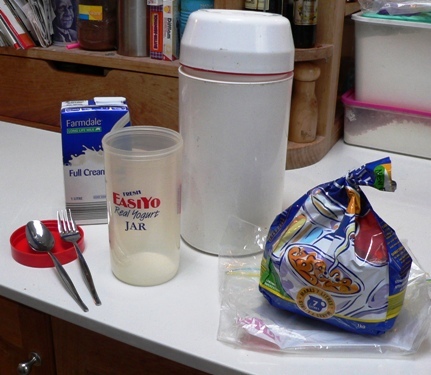 We purchased an Easiyo Yoghurt Maker, but this method will work with any suitably sized plastic thermos and jar, providing it can keep the milk warm for 8 – 12 hours. Traditionally, yoghurt is made from milk which has been boiled first to sterilise it, then cooled to room temperature. We sidestep that process by using long life (UHT) milk, which has been ultra-heat processed. In order to ensure it remains sterile, we always open a new carton for each fresh batch of yoghurt. Please excuse the unpolished photos – they were taken a long time ago! Step 1 : Fill the 1 litre jar half full with milk. Add the full cream milk powder and stir vigorously with a fork. Step 2 : Add the yoghurt, and stir well. After you’ve made this once, keep a bit back each time to “feed” the next batch. Step 3 : Top the jar up with milk, stirring well with the fork. Screw on the cap tightly. Step 4 : Fill the Easiyo maker with boiling water to the top of the insert, and place the yoghurt jar inside. If you’re using a different thermos, place the jar in first, then carefully fill with boiling water to at least halfway up the side of the yoghurt jar. Screw the lid onto the thermos, and leave for at least 8 hours (and up to 20 hours) on the kitchen bench. The longer the yoghurt “brews”, the sourer the finished product will be. Once it’s ready, carefully pour off any whey and refrigerate the jar until cold. This is such an easy system that we haven’t had to buy any yoghurt at all for years. The addition of the full cream milk powder gives a thick consistency to the yoghurt, and makes it a reasonable substitute for sour cream, both as a condiment and in baking. For our fellow Aussies, we buy our UHT long life milk (must be full cream, skim doesn’t seem to work) from Aldi at about $1/litre – we purchase four cartons (48 litres) at a time. Each container of yoghurt costs us around $1.20, a huge saving on the commercial versions which can be $5 or more per tub. We will often flavour our yoghurt with jam or vanilla syrup, or strain it through a colander to make labneh (more on that soon!). Joanna, Nancy and Christine have recently blogged about yoghurt-making as well – please have a look at their posts. It’s amazing how many different ways there are to make this ancient food! This is a great tutorial. I’ve only made yogurt once before. I’ll have to try this if I can find whole milk powder. May be a little cost prohibitive if I can find it. Milk powder of any kind is quite expensive around here. Do you know if it works without the milk powder? Cat, Pete actually wanted me to put “optional” next to the milk powder – it will work without it, but you won’t get the thick Greek yoghurt consistency that we were after. LJ, that’s why we started – there was such a cost saving in making our own. Especially if you have access to cheap UHT milk as we do here in Australia. My daughter in law made it with a slow cooker and it turned out wonderfully! I’m wondering if you couldn’t get the texture of the Greek yoghurt by putting it into a filter overnight and allowing the “extra” liquid to drain off? Home made yoghurt is so much better than the bought stuff, I wish I had ‘discovered’ it years and years ago. All those plastic tubs I would have gone through. The boys think bought yoghurt tastes ‘funny’ now. aaah, yes, I do love homemade yoghurt. Aldi makes making your own so economical, too. I started making yoghurt at home after hearing about easiyo from a friend, and cringing at the way my kids would only eat half of the flavoured tubs..leaving the rest because they didn’t like them! No wastage this way and no more plastic tubs clogging up the recycle bin. Brydie, the bought stuff tastes strange to me now too – so sweet. Pete’s yoghurt is really sour, which is how we like it! This sounds like a great idea. The lovely Greek yoghurt we buy at the markets has become quite expensive. It is certainly worth a try to make our own. Thank you. I have an esiyo maker in the cupboard but went off it when I found out I was lactose intolerant. I’ve been thinking about trying it with lactose free UHT milk. What do you think? I wonder if the change of milk sugars would affect the finished product? Chef, I don’t think it would work with lactose-free milk, because as I understand it, it’s the lactose that’s being converted to lactic acid when the milk cultures. I did find this on the net which might be of use? Wow – what a great photo, Celia. I just adore the colours! I have the Easiyo paraphernalia and use their products, but haven’t tried doing it this way up until now. This looks so delicious and creamy that I will be trying it out, thanks! Amanda, that’s the consistency of the yoghurt when it’s done – I just stir jam through it for breakfast! Thanks for the article. I used to make yoghurt a bit but haven’t for a while, you have inspired me to do it again. My boys go through so much yoghurt and it has become quite expensive in the last couple of years. UHT milk makes the process much easier, none of the boiling and cooling. And thank goodness for Aldi, they are great for so many basics things like milk, sugar, flour, butter, cheese, toilet paper, tissues, laundry and dishwasher powder and many other routine groceries. I get mad now when I walk around Coles or Safeway and see their ripoff prices for all of these things that I buy for about 40% less at Aldi (except yoghurt now that I think about it, it’s almost the same price there as the ripoff big boys). I love this recipe of Pete’s. I still have the original printout he made us, tucked away in my recipe folder. But sadly can’t get UHT milk here. Pity because we really miss this yummy yoghurt. When we lived in Nigeria, I made yogurt, I haven’t done so in years. I need to get myself some tools…..
this is amazing!!!! i’m bookmarking it and keeping it for later use, hopefully for sooner use rather than later. thanks for the great post! Dean, we go through a litre of yoghurt every couple of days! My friend El made me laugh recently – her boys eat a kilo of flavoured yoghurt every day, and she said to me recently, “that costs the same as a smoker’s habit!”. And absolutely, thank goodness for Aldi – if we had to buy UHT milk from the big supermarkets, it would cost us about 50% more per litre! Yogurt making is one of those things that I’d love to start doing. I’m just worried that I’d forget and kill it! Don’t worry about killing it, Lorraine! If it dies, it’s so easy to just pick up another tub of Greek yoghurt to start over again! My boys go through 500ml of yoghurt every two days and at $5 a throw, I’m going to give this a try. We made it years ago when we were less addled by young children but tragically I recall nothing of my former life and will have to try again from scratch. Wish me luck, Celia, it looks good. Let me know if you’d like Pete to come down and walk you through it again? i love greek style yogurt!!! you have motivated me to finally give it a try at home. thanks! Aleida, I’m sure there would be so many recipes you could use this yoghurt for! How wonderful to be able to just ‘ask and ye shall receive’. I live 245 kms in outback queensland and its hard to get the sachets for my easiyo maker (I borrowed, but have just ebayed one for me). Now I can use my UHT milk and milk powder (which I use for breadmaking) and I will save on paying our fruit and vegie fortnightly man, $6.90 for SKI. Les, thanks for taking the time to comment – I’m so happy you found this useful! Pete commented the other day that he can make yoghurt in the time it takes to boil the kettle – it’s so easy that he makes it every second day! I was wondering if you ever use yoghurt that’s been frozen as your starter? I’ve tried it a few times but find it leaves some jars thick and creamy while others are watery (as I use a yoghurt maker with 7 jars). Also, how many times can you make yoghurt from a previous batch before you have to buy some fresh yoghurt? Thanks! Ann, Pete’s just read your query over my shoulder, and he commented, “there is no end”. :) He said the only time you’d need to buy fresh yoghurt is if it a. gets contaminated, or b. gets too old, so the culture dies. As Pete makes fresh yoghurt twice a week, it never has a chance to get too old! He’s been using the same yoghurt now for years (from an original purchased tub of Greek yoghurt). We’ve never tried freezing yoghurt. Thanks for that Celia! That’s amazing that Pete’s continued making yoghurt from the original tub. Will have to try that. I’ve been making it once a week for my one year old and I usually buy a new tub of Greek yoghurt every few weeks. Your blog’s great! I’ve started making my own vanilla extract following your instructions too. One month to go before I can use it! Celia…I am so thrilled to have a long weekend so I can just read your blog, follow the links to other blogs, and be inspired. I do want to share for those homemade yogurt makers out there, you typically want to make a new batch of yogurt every 7-10 days. And it is ALWAYS recommended that you keep an emergency starter on hand. One simple way to do this for greek-style yogurt is to soak TWO cotton balls in 1 teaspoon of starter each. Allow the yogurt saturated cotton ball to air dry (place in front of a moving fan). It may take 2-3 days for the cotton ball to air dry due to humidity levels, etc. Also, as it dries it will turn a yellow color, don’t worry. Once your cotton ball is “crunchy sounding” when touched, it is dry and you will now want to place in a date labelled zip-style plastic bag. Store at room temperature for up to a month. To make a batch from your DRIED CULTURE, simply drop your 2 cotton balls in 1/2 cup of milk and proceed with your yogurt making. Yes, it only makes 1/2 cup initially…but in 8-10 hours you will have more than enough to resume your daily production. A dried culture is a wonderful way to send a culture to a friend who lives far away. For example, I have Caspian Sea (aka Masoni), Villi and Fil Mjolk cultures which are all “counter top” cultures and do not require ANY heat source at all. I use pasteurized milk straight from the container OR dry milk powder and water. No boiling of water, maintaining temperature needed. I also have Greek and Bulgarian yogurt cultures which do require heat maintenance in order to process the cultures… and this is where your Easiyo container comes in handy. There is also a great recipe found in “The Last Whole Earth Catolog” (1971) for a yogurt that is made using the residual heat from a preheated oven. If you are interested in a countertop yogurt culture, please let me know. They are more of a “drinking” style yogurt with a different taste. Quite tasty. Keep on blogging, I love to read your escapades. You are so inspiring. And I do so enjoy the links to other blogs and getting to know your net-friends! I keep telling myself if I ever make it to Australia I would contact you and see if I could rent your couch!!! Joan, I don’t know anything about making yoghurt the traditional way, sorry. We thicken ours with milk powder and have never needed to strain it.